Ok, I’ll admit it. I have just a little bit of FOMO when it comes to General Convention. Only just a little bit tho, because a) there is a bunch of exciting stuff happening at home and b) it’s hot as blazes in Austin right now. Move General Convention to February and I’m all in. Still, there are plenty of things Austin that I would love to be doing, many of which are well laid out in the Doing Austin Right visitors guide from my beloved Seminary of the Southwest. One thing they don’t speak much to, and which I have often found difficult to figure out at any sort of convention, is where and when to go for a run. 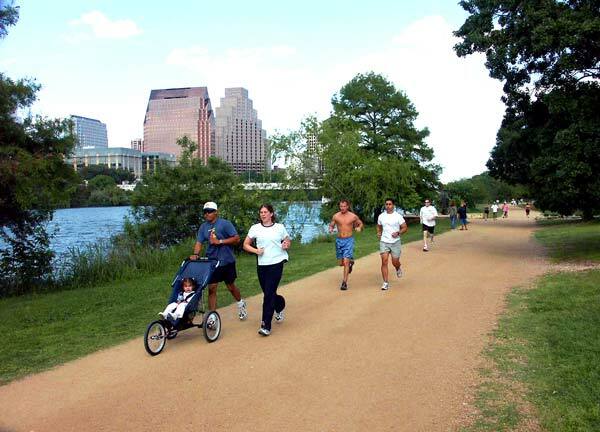 In Austin, when is easy: go run in the morning. As early as possible. If you are truly committed to running in the afternoon, prepare to get friendly with your hotel treadmill. If you run at night, you’re a freak and I don’t know what to do with you. Also, seeing the sun rise over Austin while you run is a really worth getting up for. But where to run is another question, and I have a few answers. Or potential answers. There are also some running clerics who have put some runs on the calendar for General Convention. If you’re social, check them out. If your looking to slip off by yourself for a bit, here are some places to go. All of these routes start at the Austin Convention Center, so you can reconnoiter from there to your hotel. Ok, the obvious first answer is that you should go run on the Hike and Bike Trail. The trail is easily accessible from the Convention Center area. The whole thing runs for 10 miles around Lady Bird Lake (or Town Lake, if you’re old school) but it can also be taken in sections by looping over some bridges. This route takes in a section of the lovely boardwalk and gives you a good view of downtown if you run it clockwise. One of my prized life skills is the ability to use “capital” and “capitol” correctly. Since you are in the capital of Texas, why not take in a view of the Capitol of Texas? It actually is a fun place to loop around with nice wide roads that are closed to regular automobile traffic. This year the legislature is not in session, so it should be pretty quiet. You can also sneak a peek at the Governor’s Mansion on your way back toward the Convention Center. East Austin is the best place to watch gentrification in real time. There are, however, some authentic panderias and other local joints still left. This run will also take you by the Texas State Cemetery, which is a beautiful historic spot, as well as Franklin’s Barbecue, where you can laugh at the wingnuts who have already lined up for brisket while they laugh at you for running in this dang humidity. I am often asked, “Tell us, Fr. J Dot, what is it that makes Seminary of the Southwest so special?” After several hours answering this question, it becomes clear that one simply has to see for one’s self. And so this run allows you to do. Not only will you pass the fabled mott, you will see La Casa Verde, where I spent countless hours in an Ikea chair, trying desperately to fathom Barth. (Unless they have torn that old house down, as it is rumored they will. As of this writing, Google Street View still shows it, but Street View also shows that my car is parked on the street, so don’t count on Street View too much.) This run also takes you by Darrell K. Royal Stadium, home of Austin’s pro football team, as well as through the heart of the University of Texas. You’ll graze the hip of Austin Presbyterian Seminary and swing around the Capitol. Run this one counter-clockwise. So six miles may be a lot, not only given the heat but given the amount of time folks have or don’t have to go running at General Convention. If you do find the time, I promise this is worth it. After touching the shore of Town Lake, this route follows Shoal Creek, which once separated Austin from Comanche Country. There’s a lovely paved trail beside the creek that way too few people use. You’ll swing through Pease Park, home of Eyore’s Birthday Party before winding down through Old West Austin and Clarksville which, if I had to choose a neighborhood in Austin to live in, is probably where I would choose. This run finishes up through the streets of the hip downtown warehouse district. Have fun y’all! If I get nostalgic again, we’ll talk about coffee!